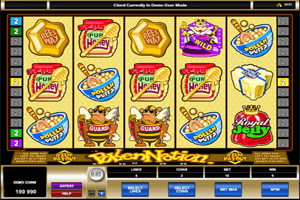 Microgaming’s slot portfolio is filled with uniquely themed video slot machines and Pollen Nation is certainly one of these games as it gives players the ability to step into the world of the bees, which explains the name of the game, Pollen Nation. It also explains the symbols that land on the reels of the game. These symbols include a guard bee, a queen bee, a working bee, Pollen Puffs, Bee Wax, Pure honey jar, baby bee, honey combo and the royal jelly symbol. These symbols appear scattered on the 25 paylines and the 5 reels of the game that players will spin after specifying their wager. These wagers are specified at the bottom where players will choose the number of winning lines they want to activate as well as the number of coins and their value. Play Pollen Nation Slot here. Since the game comes to players straight from the portfolio of Microgaming, they can expect to find plenty of winning chances and bonus symbols. For instance, players will have higher chances of winning whenever the Queen Bee symbols lands on the reels as it is wild and can substitute for any of the other symbols. There is also the scatter bee that gives players scattered rewards. Lastly, there is the BaBee Bonus that is triggered when a minimum of three Baby Bee symbols land on the reels. Players can win up to 32,250 coins through this bonus.